Today: 4 DIY crafts in celebration of Earth Day. You might want to put your seat-belts on because things are about to get all glittery up in here. 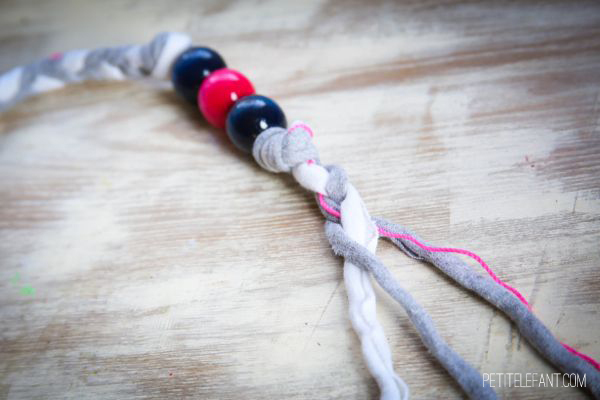 Today’s post is pretty great; some recycled accessories in the form of DIY t-shirt necklaces with beads AAAAAND 3 bonus crafts from three other amazing bloggers. All the crafts you’re about to witness (they are a thing to behold I tell you, 4 DIY crafts in one post) were created using only a few craft supplies from Consumer Crafts (the sponsor of this post) and re-cycled, up-cycled, and re-purposed materials. That’s a lot of DIY cycling folks, and I knew you’d be excited, that’s why you’re wearing your seat-belts! P.S.s.s.s.ssss. There’s a surprise at the bottom of this post. Be a very patient person and wait until the end to see what fun is up my sleeve! Ssshh! 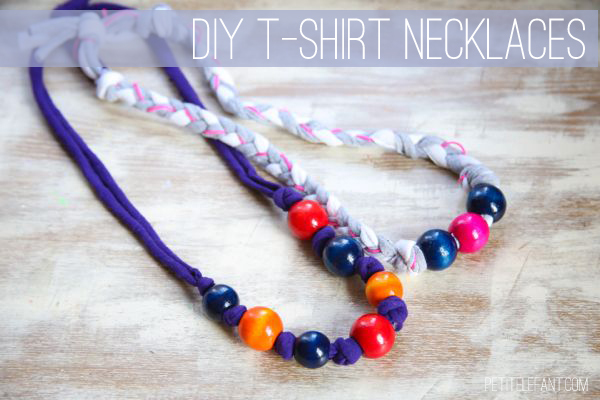 Without further adieu, here’s a whole smorgasbord of DIY, starting with the recycled t-shirt necklace. I know you’ve been searching your closets (or your hubby’s) for old t-shirts to make fun DIY polka dot scarves, right? And if you’re anything like me, as soon as you decide to start getting rid of t-shirts you have a mountain of them in no time. 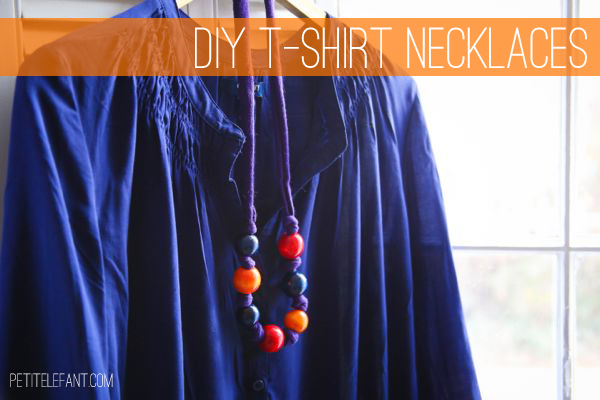 If the shirts aren’t good for scarves because maybe they have logos or are too small, fear not, you can still turn them into easy to wear DIY accessories! Do you love necklaces? I don’t usually wear them that often because the person who really loves necklaces is my 10-month-old son. Whatever I’m wearing he pulls and tugs on, and it inevitably ends up in his mouth. I love these necklaces because I don’t have to worry about them breaking! What mom doesn’t love jewelry that doubles as a distraction in a pinch? An old cotton or jersey t-shirt that you don’t mind cutting up. Wooden beads. 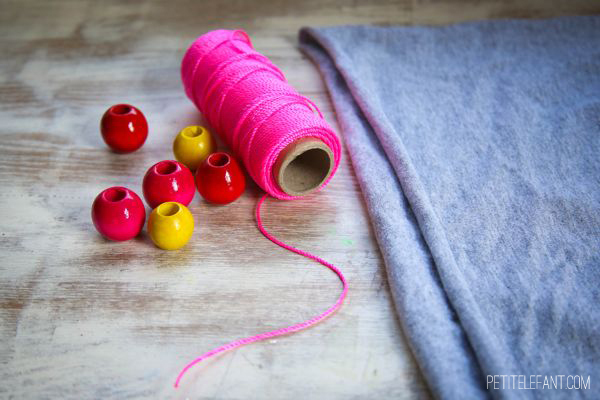 You can find colorful wooden beads at any craft store. And I’ve been looking for natural wooden beads with a hole big enough for these, hooray I found some! Neon jewelry making cord or other type of cord you want to use as embellishment. 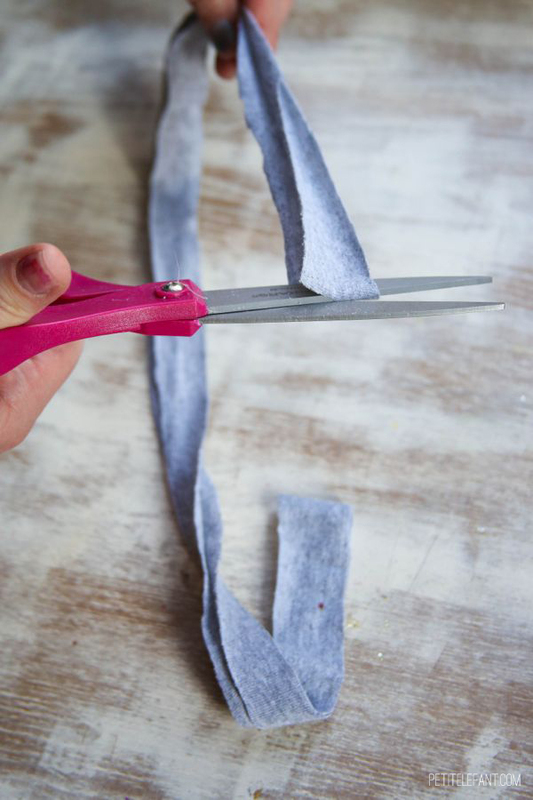 Cut strips of fabric about 1-inch wide across the shirt. 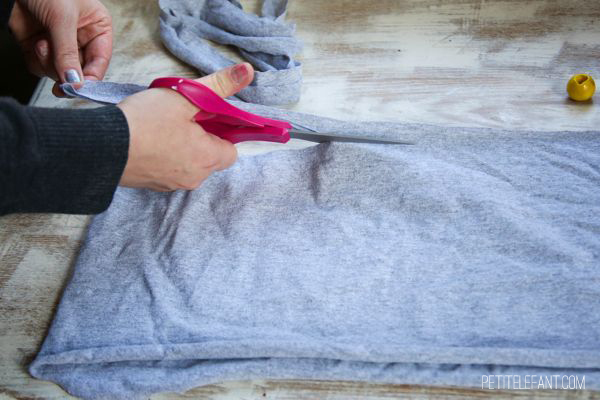 Then snip the loop so you have one long piece of t-shirt material. 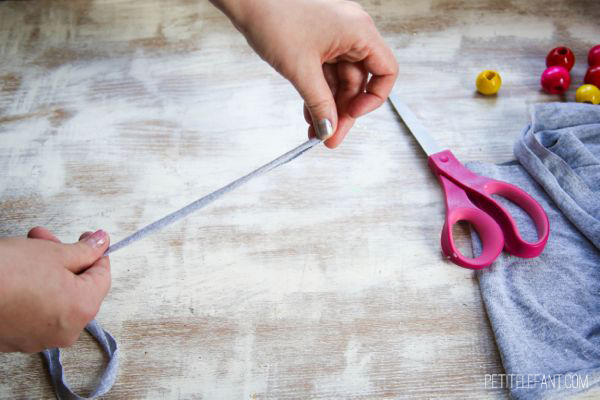 Stretch the material to both lengthen it and get the sides to roll in. Start stringing the beads onto the t-shirt strands. 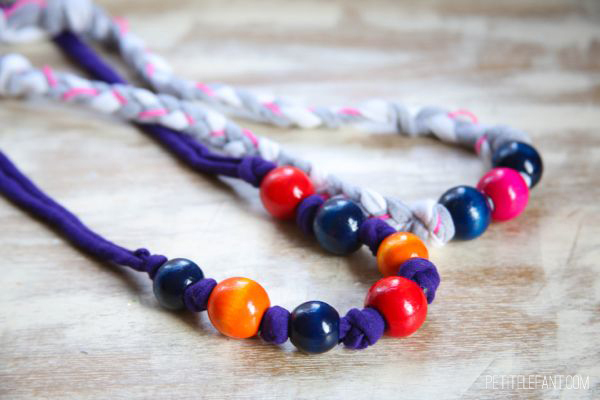 For this necklace I knotted the material on either side of the beads and braided it with the neon cord. 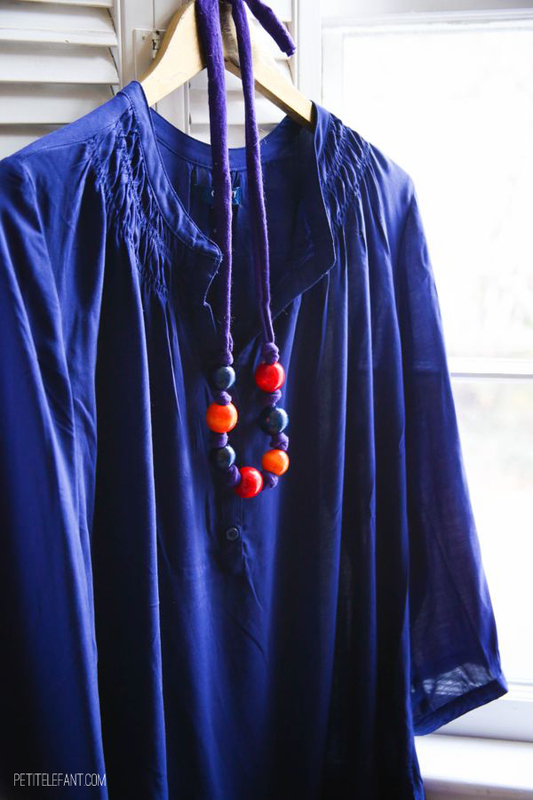 For the purple necklace I just knotted the t-shirt material between each bead. 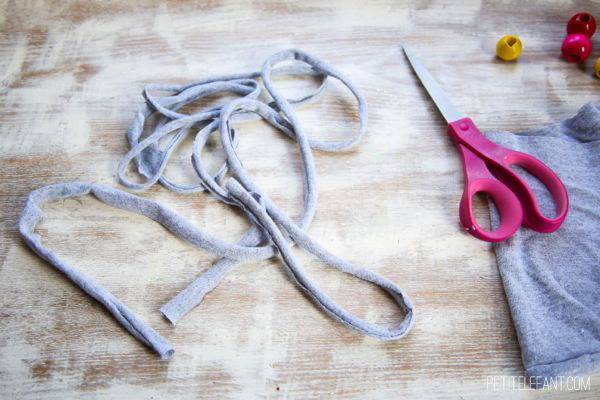 Tie the fabric together at the end and you have the perfect summer accessory. I love a DIY craft project that uses materials that almost everyone already has. It’s budget – and Earth – friendly. How are you celebrating Earth Day? Now, onto the delightful creativity of some amazing DIY bloggers and their Earth Day creations. Aren’t all those crafts fantastic! What a perfect way to celebrate Earth Day. SURPRISE! There’s also a $250 craft supply pack giveaway from Consumer Crafts up for grabs! Thank goodness you stuck around until the end! The winner will be announced on April 22nd on a new post. Good luck! Enter the giveaway and win some loot so you can get your DIY on! My girls are going to love to make these! My favorite craft supply is always sculpey! I love to work with fabric and paint! I like beads, yarn and paint. Fabric is my favorite craft supply! I’m obsessed. I am doing this craft with my daughter and her friend next weekend! I love crafting with beads! It’s so hard to pick a favorite craft supply because I love it all! I go through phases and right now I’m really into jewelry (and I have lots of old t-shirts so can’t wait to try this craft!) so right now my favorite supply is wire! :-) Thanks for the chance to win! Glue! You can do a lot with glue- stick stuff, glitter stuff, make dimensions on stuff. I love shopping for beads because their fun but my really useful supply is my assortment of pliers. I love anything to do with yarn! I’m also getting into beading because I’ve always wanted to make jewelry. I love anything to use for papercrafting! I love these recycle ideas and I have made all of them in the past (lol). Old things made new!